If you have an Instagram account and don’t know who Melanie Santos is, you must be living under a rock. An Uruguay-based teenage amateur make-up artist who has managed to rack up more than 120,000 thousand followers in under two years, Melanie has captivated her legions of devoted fans with her flower-laden, ethereal-faerie-meets-manic-pixie-dream-girl looks and playfully apathetic attitude toward her newfound online fame. Often posing in berets, (literally) rose-colored glasses, pastel wigs, and jewelry fit for a Nordic queen, Melanie accompanies her selfies with simple captions, usually either of adorable Kawaii emojis or Death Grips song recommendations, giving her followers a glimpse into a complex, multi-faceted individual that is only skimmed by the content of her Instagram profile. obsession of yours, or a passion that developed as you grew older? I am 17 years old, turning 18 in June. I find it quite interesting when people ask me how make-up became a part of my life. I’ve never watched a make-up tutorial or have had anyone “teach me” how to do it. Not that I believe being formally taught to do make-up is wrong, however, in my case, I learned through observation and experimentation. I began at the age of 16, when my interest in make-up began as a form of artistic expression. Before this I would only cover my freckles with concealer and occasionally put on eyeliner. Putting on make-up in public used to make me feel insecure, and to be honest, it still kind of does. I only put on make-up to go out about 10 times a year or less. I don’t have a method to my make-up, so I just do it when I’m bored at home, like when I draw or design clothing. I also never use specific brands, I have very little make-up. I actually only use four products! style has been influenced more by sources at home or abroad? A little bit of both, but what really inspires me most isn’t any fashion or beauty trend in or outside Uruguay. I’m more inspired by nature: the origin of makeup began with using the tint of flowers, and I try to incorporate this idea into my looks as much as possible. The photography and the fashion trends of other countries also influence my style to a certain extent, but my friends, mother, and Uruguayan make-up artist Hiele Pierrez have been incredibly impactful on the way I do my make-up. you confidence, stress, or both? I love this question. I love them all, but I have a lot to say for this one in particular. I do find it hard to gauge how people perceive me, although I don’t like to spend time wondering how I’m impacting others. But when I’m with a friend, a peer in school, or someone I just met and the topic of my “Instagram fame” comes up, it surprises me what people think of me. I feel like people idealize me too much: they see me as a “tumblr-stereotype” which is far from who I really am. It’s hard for me to understand why people compartmentalize me in their minds like this; I’m not the type to idealize a person, as I will always admire the work that an artist creates rather than the artist themselves. The answer to whether it brings me stress or not is really neither of the two, as I don’t spend a lot of my time on my Instagram really, I don’t spend time looking at my notifications, and although I want to take the time to answer all my messages from fans, at the same time I don’t know what to say. Not to say I don’t appreciate those who write to me; I’m incredibly grateful to those who share an appreciation for what I do, and it’s really great. A lot of things contribute to my developing confidence, but to say that my Instagram account is one of those things would be a lie. 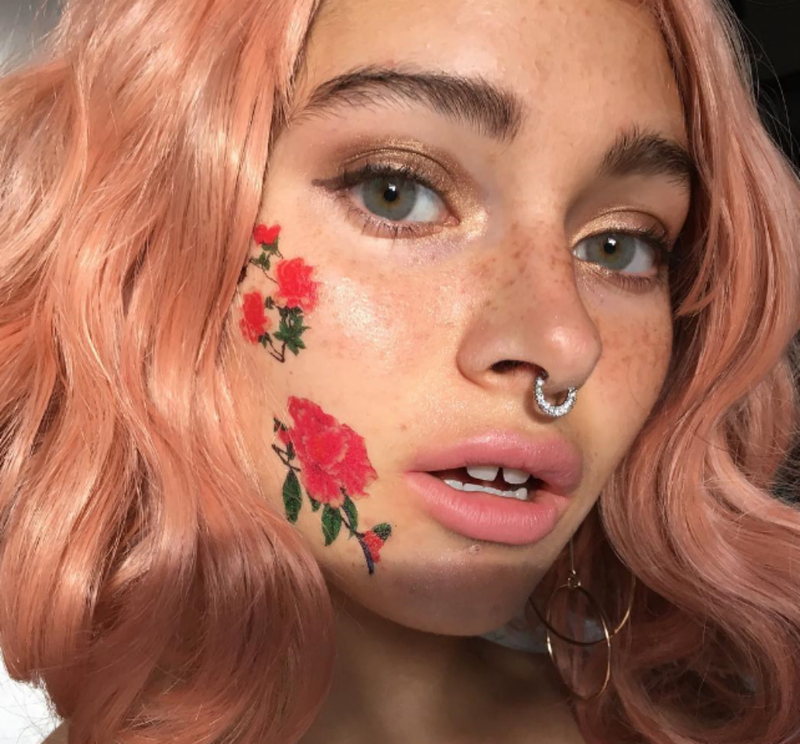 Using temporary tattoos as a component to a make-up look is practically unheard of in the fashion and beauty industry. 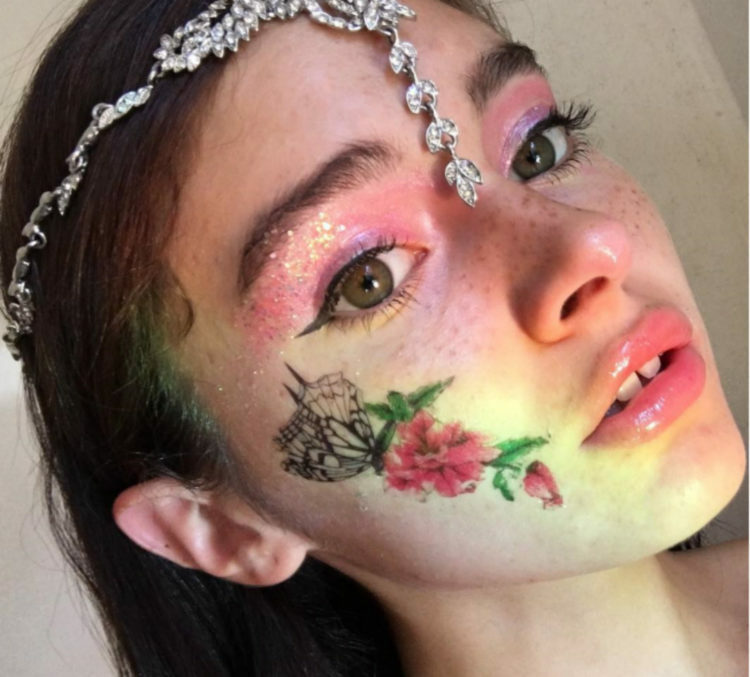 Where did you get the idea to put temporary Tattoos on your face? I enjoy experimenting with new ways of seeing myself, and I believed that wearing temporary tattoos could look very nice and be fun. Right now I’m hunting for new ways to see myself and play with my face.